Very much focused focused on the United States but available to but in the UK. Although it is highly unlikely you will find in the likes of Holland and Barrett, Boots etc…. Clinicallix claims to be unique and requests that you stop wasting time on slimming pills that dont work – and presumably buy theirs! Capsiplex was completely sold after just three days of going on sale and has now sold over one million units. Basically a fat burner that uses ingredients from already existing products but claims to be the strongest fat burner with clinically tested and proven ingredients. The above ingredients are used as a staple ingredient in a number of specially formulated slimming pills – but in reality offer nothing new. The clinical trials have been undertaken on each individual substance but not as a whole. A majority of fat burners can cause restlessness, anxiety and insomnia. Extremely hard to give any kind of recommendation to. 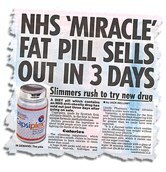 If you are still at the research stage – you should understand that a majority of slimming pills available to buy without the need of a prescription are prone to unsubstantiated and dubious claims of success and quick results.